Seventeen years ago, astronomers observed a supernova explosion at a distance of 40 million light-years in the galaxy known as NGC 7424, in the southern constellation Grus, the Crane. At present, NASA’s Hubble Space Telescope has taken the first ever image of a living companion to a supernova, in the faint afterglow of the explosion. This image is the most convincing evidence that some supernovas emerge out of double-star systems. The supernova progenitor star’s companion was not an innocent spectator to the explosion. It absorbed nearly all of the hydrogen from the stellar envelope of the lost star—the region responsible for transporting energy from the core of the star to its atmosphere. Innumerable years before the primary star encountered the supernova explosion, the larceny by the companion resulted in instability in the primary star, making it to accidentally explode a cocoon and shells of hydrogen gas prior to the explosion. 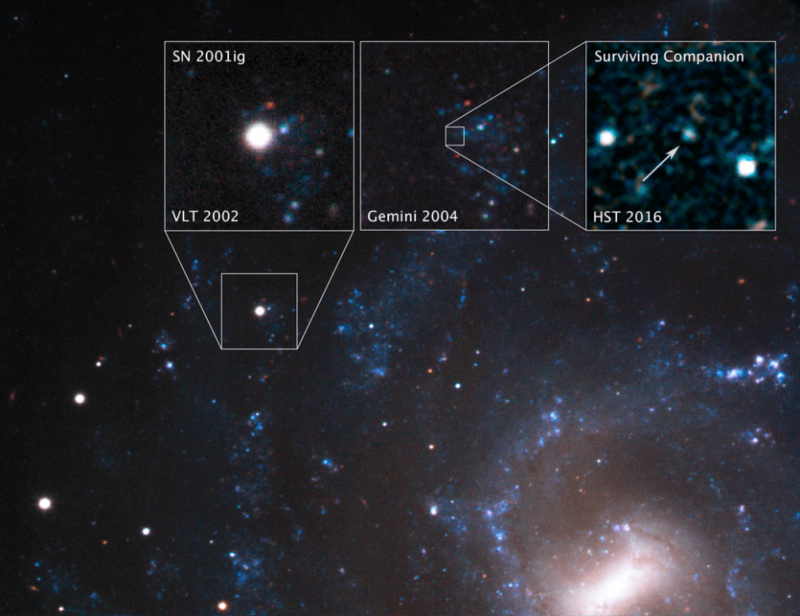 Christened SN 2001ig, the supernova is classified as a Type IIb stripped-envelope supernova. A supernova of this type is uncommon since a majority, and not all, of the hydrogen, is used up before the catastrophe. This kind of exploding star was initially recognized in the year 1987 by one of the members of the team, Alex Filippenko from the University of California, Berkeley. It is exactly not clear how these stripped-envelope supernovas lost the outer envelope. Actually, they were considered to have originated from single stars with winds of high speed that pushed off the outer envelopes. The difficulty was that when astronomers began the search for the primary stars from which supernovas were generated, they were unable to zero in on them for several stripped-envelope supernovas. This reality made researchers hypothesize that several of the primary stars were in lower-mass binary systems, and they endeavored to confirm that. It is not easy to spot a binary companion at the end of a supernova explosion. First, it has to be located relatively close to Earth for Hubble to observe such a fading star. SN 2001ig and its companion fall in that range. Not many supernovas explode inside this distance range. It is more important that astronomers have the knowledge of the exact position by carrying out very accurate measurements. In 2002, soon after the explosion of SN 2001ig, researchers identified the exact location of the supernova with the help of the Very Large Telescope (VLT) of the European Southern Observatory, in Cerro Paranal, Chile. Then, in 2004, they made a follow through using the Gemini South Observatory in Cerro Pachón, Chile. This observation gave initial clues to the existence of a living binary companion. By being aware of the precise coordinates, Ryder and his colleagues could focus Hubble on that location after 12 years, after fading of the glow of the supernova. Hubble’s ultraviolet capability and exquisite resolution helped them find and image the living companion—something which could be achieved only by Hubble. Before to the explosion, the two stars took almost a year to revolve around each other. The impact of the explosion of the primary star was far less on the living companion than anticipated. Consider an avocado pit, which represents the companion star’s dense core, enclosed in a gelatin dessert, which represents the gaseous envelope of the star. When a shock wave passes through, there is a possibility for the gelatin to temporarily stretch and wobble; however, the avocado pit would stay intact. In 2014, Fox and his colleagues, with the help of Hubble, detected the companion of another Type IIb supernova, SN 1993J. In this case, they captured only a spectrum, in the place of an image. SN 2001ig is the first case in which a living companion has been imaged. “We were finally able to catch the stellar thief, confirming our suspicions that one had to be there,” stated Filippenko. Maybe there are companions to nearly half of all stripped-envelope supernovas—the outer envelopes of the other half are lost in the stellar winds. The ultimate aim of Ryder and his colleagues is the precise determination of the number of supernovas with stripped envelopes that have companions. Their next work is the observation of completely stripped-envelope supernovas, and not SN 2001ig and SN 1993J, which were stripped only around 90%. There is not much shock interaction of these completely stripped-envelope supernovas with gas in the surrounding stellar environment because their outer envelopes are long-lost before the catastrophe. The lack of shock interaction leads to fast fading of these supernovas. This indicates that it will be only two or three years before the researchers spot living companions. Moving forward, the scientists also hope to use the James Webb Space Telescope to continue their study. The present study of the team has been reported in a paper published in the Astrophysical Journal on March 28, 2018. The Hubble Space Telescope is a project of international cooperation between NASA and ESA (European Space Agency). The telescope is managed by NASA’s Goddard Space Flight Center in Greenbelt, Maryland. Hubble science operations are conducted by the Space Telescope Science Institute (STScI) in Baltimore, Maryland. The Association of Universities for Research in Astronomy in Washington, D.C., operates the STScI for NASA.